An analysis and explanation of the new major shift in American foreign policy, its interests and assets, to Asia by one of it's principal architects. Campbell’s new book, The Pivot, is understandably defensive about both the policy and Clinton’s role in implementing it. At times, that makes this very readable policy book seem too safe and unchallenging, as if Campbell is laying out his vision for the secretary of state’s job if Clinton wins the election ... The book is best when Campbell provides personal anecdotes from his travels around Asia...Also valuable — but far too infrequent — are his insider’s accounts of the fascinating dynamic between erstwhile rivals Obama and Clinton ... This is no 'tell all' by a former high-ranking official but a studious, policy-oriented book, designed not to challenge conventional wisdom or offend. 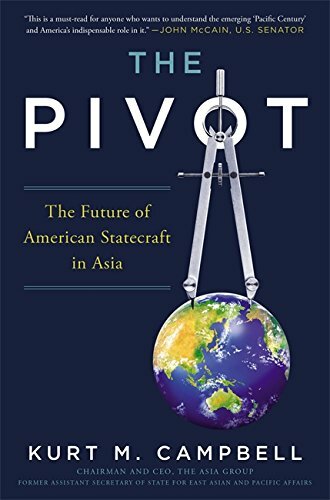 [Campbell] offers some important insights into the emergence of what many are calling the 'Asian Century' ... Interestingly, Campbell is highly critical of FDR’s neglect of Asian affairs in the early-to-mid 1930s, and President Truman’s early postwar disengagement from Asia ... There is nothing controversial or provocative there. But his approach to the pivot is largely based on a progressive outlook. Campbell’s persuasive book suffers two flaws. First, he largely ducks the question of how tough America should be on China if it continues to thumb its nose at international rules — for instance by building more islands in the South China Sea. Second, he does not look in any great depth at how his various diplomatic manoeuvrings might appear from Beijing, which suspects America of plotting to stymie its rise. What did you think of The Pivot: The Future of American Stagecraft in Asia?